Garage Door Services Inc. of Taylors, SC, is a company that offers over 20 years of experience in the garage door industry to the Greenville and Spartanburg markets. Our business specializes in both commercial and residential overhead door sales, gate operators, installation and repair. We are dedicated to offering the highest quality garage doors and service at affordable prices. 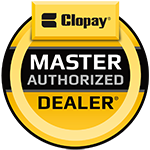 We carry all models of high-quality Clopay® Doors, as well as LiftMaster® electric operators. In 2018 we opened up Home Specialties Center to assist our customers with more than just their garage door needs. While our showroom does have full size garage doors on display, you can also get help with garage storage solutions, custom closets, screened porches and more! Come visit us or contact us for more info. Whether it is a large commercial installation, a garage door for your home, or a new screened porch, our service is second to none.